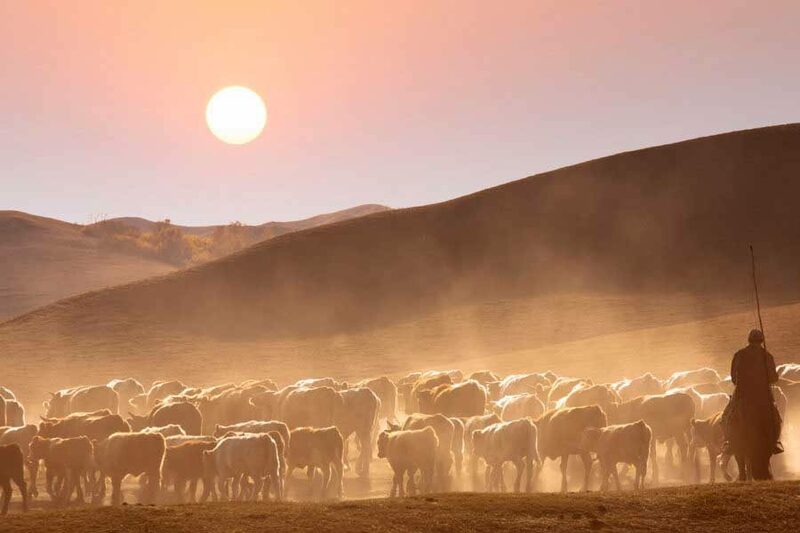 On ranches and farms around the world, business aircraft are not a luxury; they’re a necessity. Aircraft specially designed for the rough runways that connect fields and feedlots shuttle farmers, veterinarians and crop experts to remote facilities and meetings hundreds of miles from home base. From Paraguay to Kansas, the story is the same—an aircraft is the workhorse of the trade. Managing 200 employees, 30,000 head of cattle and 44,500 acres (18,000 hectares) of wheat, corn and soybean crops keeps Henrique Junqueira on the move. Traveling between three farms in Paraguay’s rural San Pedro and Alto Paraguay territories, Junqueira relies on his Beechcraft® Bonanza® G36 aircraft to cover the 1,850-mile (3,000-kilometer) round trip every week. “My Bonanza is my pickup truck of the sky. I can do a lot of things without losing time to the highways,” said Junqueira, who’s logged more than 200 hours flying for his family’s multi-generational farming operation. Paraguay’s tropical savanna climate supports cattle ranching as well as a variety of cultivated crops, but rainy season flooding, poor and unpaved roads with little maintenance make it difficult, if not impossible at times, to reach the country’s remote agricultural areas where Junqueira’s farms are located. “In the beginning, we didn’t have access to the farms or ranches. The Bonanza makes my life easier now; it’s possible to manage everything,” said Junqueira. To reach his cattle 430 miles (700 kilometers) away in Alto Paraguay, Junqueira often drove 12 hours one way, navigating indirect routes on treacherous roads. With his Bonanza, Junqueira can land on the ranch’s dirt airstrip, arriving in just two hours—a net gain of 10 hours thanks to direct routing and the aircraft’s more than 200-mile-per-hour (320-kilometer-per-hour) cruising speed. Flying saves Junqueira more than three hours, reaching another farm 310 miles (500 kilometers) from the company’s home base in Asuncion. Fewer hours on the road translates to higher productivity, allowing Junqueira to accomplish more in a single day—whether that’s visiting another location, meeting with customers or handling paperwork. Junqueira can also take a veterinarian or agronomist out to the ranches, putting his experts right where he needs them. Junqueira’s family has long understood the value of owning and operating an aircraft for business. Over the years, they’ve had a Cessna® 210 and Bonanza F33. Junqueira handpicked the aircraft he wanted, upgrading to a Bonanza G36 with a Garmin™ G1000™ avionics. Roy Brown, Cattle Empire’s chief executive officer, admits there’s not much in western Kansas, save for vast land ideal for raising cattle. In 1995, Brown purchased a feed yard with an 11,000-head capacity and later merged it with his father’s 50,000-head operation. Today, Cattle Empire manages the fifth-largest feeding operation in the country with 250,000 head of cattle spread over five feed yards within 20 miles of each other. To bridge the distances to client and supplier meetings, industry conferences and a trucking depot in Colorado, as well as keeping highly valued employees happy, Brown turns to one of his most important tools—the company’s Beechcraft King Air® C90GTx turboprop. “The aircraft has been an instrumental part of our expansion,” said Brown. Employees log about five flights per month for business, many to Denver from Cattle Empire’s location in Haskell County in the southwestern corner of Kansas. The King Air converts the long two- or three-day round trip by car to the Mile High City—12 hours of total drive time—to a short, one-day trip—two hours of total flight time. “The time change works to our advantage, too. An employee can leave Kansas at 8 a.m. and arrive in Denver at 8 a.m. The King Air not only saves time and hotel costs, employees arrive fresher to their meetings, plus they’re not worn out for several days afterward when they get back home. Most importantly, they don’t have to miss time with their families,” said Brown, who also leases time on a jet for trips longer than three hours. Along with saving time en route, Brown likes that his time in the aircraft is more productive than sitting behind a desk. “My best work time is in the aircraft. No one can interrupt me. An hour in the airplane is worth about six hours at my desk,” he said. Cattle Empire also uses its aircraft to bring customers and potential clients out to inspect the cattle and the company’s operation. “The King Air allows that to be a day trip if the customer wants it to be. Often, they’ll come up one day and go home the next, allowing us to wine and dine them—at least the best we can in Garden City,” said Brown. About 60 percent of Brown’s cattle are Holsteins, with 40 percent comprising native cattle — Angus, Hereford and others. Unlike most ranchers, Brown raises the Holsteins from day one. Brought in from a five-state area, the bull calves are fed a special diet until they reach 1,475 pounds. Careful attention produces fork-tender steaks with 85 percent of the Holsteins rated choice or prime, the top two USDA grades of beef. It’s that attention to detail that allows Brown to use his aircraft to meet another key business goal—keeping key employees on the job. He says there are also intangible benefits of ownership—time with family, more peace of mind when traveling and employee satisfaction.